The big roar made over Samsung’s S-Pen design flaw (where it could get stuck and break the S-Pen detection sensor) was brushed off by a simple “read the manual” response, but that doesn’t mean Samsung isn’t going to take preventative measures. While the company maintains that the phone is designed just fine, they’re making sure owners know exactly how the S-Pen should be inserted into its holding bay. The company is now including a warning on the label that is wrapped around the phone when you first take it out of its package. It’s something that should be common knowledge — the tip of the pen goes in first, just as you might naturally do on some notebooks with a pen holder. 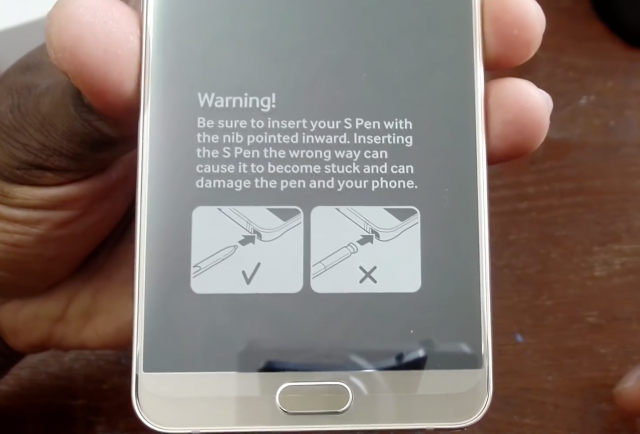 This warning was actually in the user manual (you know, that thing that no one ever reads but swears they did when they call technical support) when the phone launched, but having it up front and center should hopefully cut down on S-Pen incidents. And if you are still unfortunate enough to mess it up, be sure to take a look at some alternate steps to recovery before you yank the thing out and break it.